At 16.11h on Oct 6 I uploaded this article. 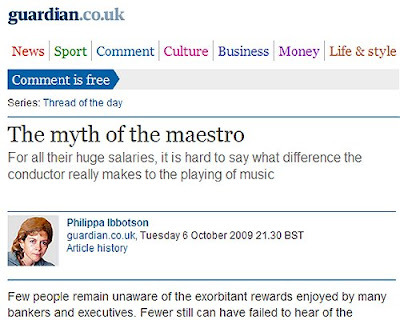 At 21.30h on Oct 6 the Guardian website published this article. Most, however, were composed after 1890 and require humungous resources. That alone makes these performances costly. So, maybe, the clue to financial stability is for orchestras to pair-down, perform older (and newer!) works that don’t require so many musicians, and occasionally get someone to conduct the bigger works. The late 19th /early 20th century orchestra is truly a product of the end of the Industrial Age and the central focus of the Consumer Age. We are, I believe, in the post-ages for both. And small is good again. There was a podcast recently on some site (can't recall which) that had Oliver Knussen talking about conductors, demonstrating how quickly things can get out of whack without one. In this, he was channeling Leonard Bernstein, who talked about this on an Omnibus program over 50 years ago (1955). Whether or not they're overpaid is a different matter entirely (one could say the same thing about software program managers compared to the developers who actually build the darn things), but if a conductor "doesn't make a difference" to the music, then classical music, recording-wise, might as well be like rock music (or film scores), where only the first recording of a work is necessary or "valid". Obviously it is not. The Guardian article speaks from a position of sheer ignorance and self-righteousness.